The first river to clear from snowmelt is the Firehole; it's often the only game in the Park on the opener, and each May a group of Firehole River regulars eagerly awaits the Memorial Day weekend. The Firehole usually offers great dry-fly fishing during afternoon mayfly hatches and continues to do so until the end of June. By the second week of June, the Gibbon and Madison Rivers drop and clear, the ice comes off Yellowstone Lake, and the fishing season is under way for other waters. One by one the Parks rivers run clear of snowmelt, and most become fishable by July 4. Usually, the last rivers to clear are the Yellowstone and Lamar in early July. There are over a hundred lakes and a thousand miles of streams in Yellowstone National Park; nowhere in the world are so many public rivers and streams found in such a condensed area. Seven varieties of gamefish live in Yellowstone: cutthroat, rainbow, brown, brook, and lake trout, along with grayling and mountain whitefish. Only cutthroats, grayling, and mountain whitefish are native to the Park. In the 1890s, any lake, stream, pond, river, or slough that held water was stocked with fish. Little was known then about fisheries management; many of these places could not support self-sustaining populations and returned to their former barren state. 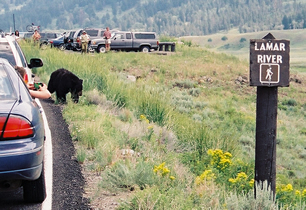 The Wildlife is also fun to avoid. Those that could support fish retain wild populations to this day. The last fish were stocked in Yellowstone in the mid-1950s. These are just a couple of the many places we enjoy fishing for large and small trout. We fish mostly in the west, but are always up for traveling where ever the fish are hitting. Learn about the flies we've used, so you can tie them up before heading out to the next place you go to fish. Learn easier techniques to know where the fish are holding, i.e. just by moving along the shore of the lake or by casting 1-3 ft to either side of a large boulder(about 6 ft in front) this will put you in front of more fish. Soon to come we will tell you what to watch for when fish are rising. So that you can pick the best choice of nymph, emerger, dun/caddis or spinner. 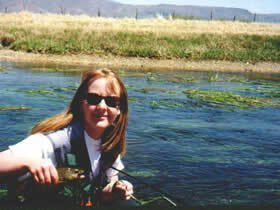 One of our favorite rivers for small fish is Spring Creek just outside of Heber and Midway, UT. It's stocked with small German Browns like the one Gina caught(to the right), but occasionally you'll have a 18"-20" come up from Deer Creek Resivoir. The trip has never been complete without stopping at Don Pedros for good Mexican Food or to get a burger and homemade sherbet at the Timp Freeze. I'm not sure if its the small German Browns that keeps bringing us back or the good food.